Solid solutions between K-feldspar and albite are called " alkali feldspar". Solid solutions between albite and anorthite are called " plagioclase",  or more properly "plagioclase feldspar". Only limited solid solution occurs between K-feldspar and anorthite, and in the two other solid solutions, immiscibility occurs at temperatures common in the crust of the Earth. 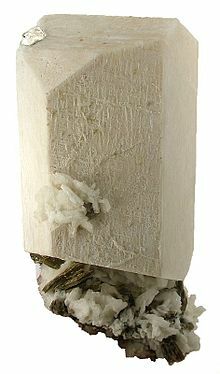 Albite is considered both a plagioclase and alkali feldspar. Lunar ferrous anorthosite #60025 ( plagioclase feldspar). Collected by Apollo 16 from the Lunar Highlands near Descartes Crater. This sample is currently on display at the National Museum of Natural History in Washington, D.C.
^ Rudnick, R. L.; Gao, S. (2003). "Composition of the Continental Crust". In Holland, H. D.; Turekian, K. K. (eds.). Treatise on Geochemistry. Treatise on Geochemistry. 3. New York: Elsevier Science. pp. 1–64. Bibcode: 2003TrGeo...3....1R. doi: 10.1016/B0-08-043751-6/03016-4. ISBN 978-0-08-043751-4.